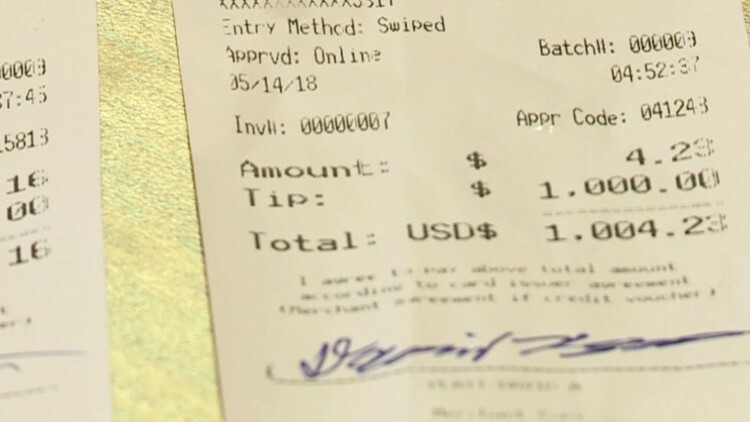 A Mississippi truck driver gave a Roland mother of two a $2,000 tip on Mother's day. ROLAND (KFSM) - A waitress at 4 Star Diner in Roland received a hefty tip of $2,000 from a Mississippi truck driver on Sunday, May 13. "The other customers were coming to pay out and he said $1,000," Brenda said. "I said what? Are you serious? He said yes. I couldn't believe it. I couldn't hardly breathe. It took my breath away." It was $1,000 that truck driver, David Platt, thought Pearson needed. "I have two children at home," Brenda said. "I`ve been a stay-at-home mom for a couple of years. It will help us get caught up on the move. And it was just God-sent." "Some of the girls get $20 on Sunday and stuff when they have special deals," customer Violet Hubbard said. "But $1,000, $2,000? It`s amazing." "Money is just paper or numbers on a screen," David said. "Self-gratification only goes so far. So, when you`re helping another person, you`re adding something to the world. It`s an investment and people, people are what`s important."